So its official, Amazon enters the tablet market with a bang! 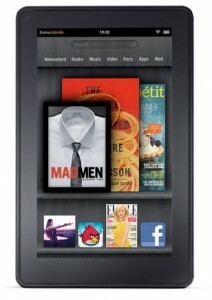 Amazon today has announced a new tablet called the Kindle Fire and also a $99 Kindle Touch at an event in New York. The Kindle Touch keeps its e-ink screen, but both the Kindle Fire and Touch now integrate heavily with Amazon cloud storage. The $199 Kindle Fire is a full-color, TI OMAP 4 dual-core tablet running Android 3.1 Honeycomb that will have cloud access to movies, songs, and Android apps. The tablet has a 1024×600 resolution, is 11.4 millimeters thick, weighs 14.6 ounces, and uses Amazon’s Whispersync service to access a “carousel” of media selections, and users can “pin” favorites from the cloud to their device. Amazon also introduced a new browser called Amazon Silk is included on the Kindle Fire that is also part of the Amazon’s Elastic Compute Cloud service, which helps the tablet to load web pages very quickly. Silk stores common files from around the web in cache on EC2, allowing it to pass them to the Kindle Fire to speed up load times, and can predictively load content for your next page click. The Kindle Fire will not be capable of 3G access. The cloud storage is supplemented by 8GB of local storage on the tablet. The new Kindle Touch weighs 5.98 ounces and does not have a capacitive screen; instead, it uses infrared sensors to accept touch input. The device is about the same size as previous Kindles and no longer sports a keyboard. Jeff Bezos, CEO of Amazon, stated at the event that Kindles will now store books for free in the cloud, and will have an “X-ray feature” that precaches information from dictionaries and Wikipedia that is relevant to the displayed text. The $99 version of the Kindle Touch will be WiFi-only, and a $149 version with 3G access will also be available. Bezos also noted that there will be $79 non-touch version of the Kindle for customers who “don’t want touch.” Amazon says that the new Kindles turn pages 10 percent faster than before, and though they are smaller, they still have the same 6-inch screen as the previous Kindle. The WiFi-only Kindle Touch without ads is priced at $139, and the Kindle Touch 3G without ads is $189. Currently, there doesn’t appear to be a “Special Offers” version of the Kindle Fire. The Kindle Fire ships November 15. The non-touch version of the new Kindle ships today, while the other two touch versions are available for pre-order now and ship November 21. Previous iPad Killer? Amazon to Unveil “Kindle Fire” Tablet Tomorrow!